Fr. Mike, are you accepting invitation to speak? Not right now. My travel schedule is established until the end of the 2017-2018 school year. In the summer of 2018, I’ll review my new school calendar, pray, and discern my travels for the new school year. When you begin accepting invitations, how do you plan your schedule? My primary ministry is with the students here at the University of Minnesota Duluth. So you can imagine that my school year is quite busy! Also, I believe that to maintain a healthy life, I need time to rest and be with my family. So I can say “yes” to some events and “no” to others. What days of the week are you able to travel? 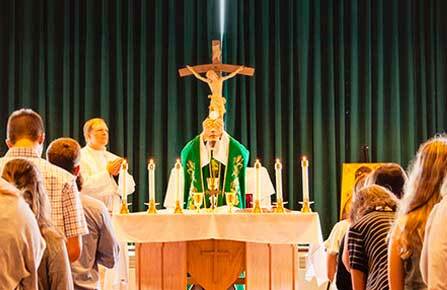 The most important thing that I do is celebrate Mass here at UMD. So if your event is on a Sunday, it won’t work. How much does it cost to have you speak at my event? I don’t have a set fee, but knowing the limitations of some parishes and diocese, I can accept what you typically offer for that service. What subjects do you speak on? I can speak on a lot of different topics. I prefer that you give me direction based on the theme of the event.